There is a saying in Kannada “Tambali antha ootavilla kambalianth hodikeyilla” -Â meaning, there is no meal like the one with tambali and there is no cover (wrap up) like blanket or rug. Rice is the main constituent of any meal for people in the south Indian region. Hence a curry is an essential thing to go with rice. As coconut is available freely, people started using it to make different types of tamblis which are easy to cook and very tasty. Tambli and chutney are the two varieties of the same preparation. Tambli is not cooked or heated. 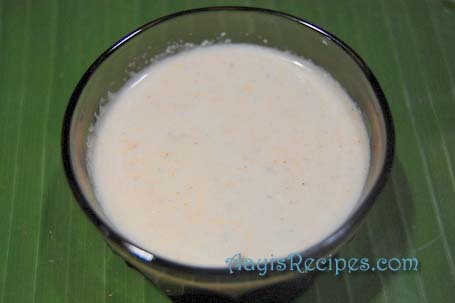 In Kannada, tampu (cold) + huli (gravy) = tambli. As the name suggests, it is a cold recipe. There are usually 45 -50 types of tamblis. BonDi is the flower of banana as seen in the picture below. Many people know that different parts of banana tree are used in the cooking – like stem (bale dinDu), leaves, flowers(bonDi or bale mooti) and bananas itself. 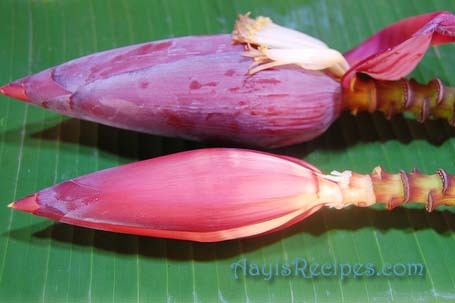 Take the banana flower and remove the outer coverings one by one, till it is free from all the flowers surrounding it. 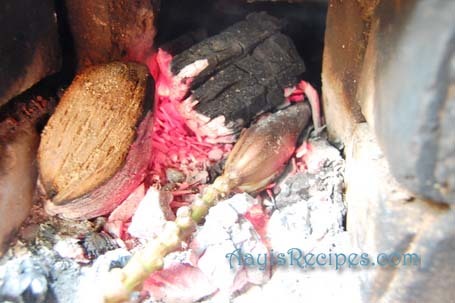 Put the banana flower on burning red charcoal (I normally put it in fireplace). Once it is baked, usually it takes 5 minutes, then take it off. Try to peel off the blackened portion and keep aside the white portion. Take all other ingredientsÂ in a mixer and grind to a smooth paste. Add the baked banana flower to it and continue grinding for some more time. Add some water to make it like gravy. Serve it with hot rice or chapatis. It is simply out of the world when consumed with rice and urad papads. This is a very new recipe to me Aunty!! Kenna taste kelilna haave, but ekdam bare dista assa.. I never knew you could grill a banana flower ! Is’nt Tambli always made with yogurt ? Shilpa: No Ramki, we have many tamblis which don’t have yogurt in them. Wow… you guys have so many unknown recipes. Thanks Mami for posting such an unusual recipe. Have added your recipe in the 1001 Tambli cookbook. Thanks for the recipe and for the quote ! I had always seen maharashtrians when I was in Mumbai, buying Banana flower fromthe vegetable vendors, but never had seen or tasted the dish. Today I saw how the flower is used in cooking. Are there other dishes made out of Banana flower?? Shilpa: Purva, I have seen some blogs with Malayalam cooking where they made stir fries and other things with banana flowers. I think there are other dishes in Konkani cuisine which uses these flowers. where did you get hold of banana flower here??!?! Amazing recipe… I love thambuli of any kind! Shilpa: Aayi made this at home with the banana flowers from our garden :). Hai Shilpa, i’m Punitha, Wov !!!!!!! it is completely new dish to me , and it is very very useful for ladies having stomach problems.Please keep it upppp……. i know around 25 tambli recipes and never knew there r as many as 50 types of tamblis… and one such recipe i was not aware of is this bonDi tambli. thank you for posting such a unique recipe. This one reminds me of Nallachi Kodi. Can banana flowers be dried and used later? Or maybe grilled and dried? Shilpa: I haven’t seen the flowers being dried anytime. Don’t know if that works. Very intriguing! Can these be dried and used later? Or perhaps grilled and dried? How big are these flowers? Thanks! Wow, aayi, what a unique recipe. Never tasted this Tambli before, although have tasted all other tamblis..
Will definitely let my mom know..she would be intrigued, I am sure.. 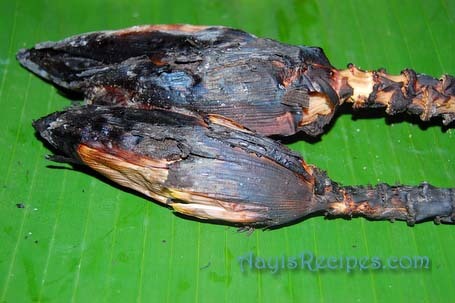 I have only cooked banana flower once to make upkari with black chana\vatana. So to answer Purva’s question, yes you can try any upkari recipe. Even the Bengalis have their own recipe which my friend does everytime she invites us. You could probably also make sukke recipe too. Grilling and oven baking should work too. I have never seen the dried variety in any markets..Tinned (which is available tyhese days) will not work either as it will have a different taste to the one roasted. Anyway, Aayi, thanks for once again coming up with a new recipe..
Shilpa, thanks for posting such an interesting recipe. I will try this as soon as possible. Never thought of roasting bondi in OOJO, this is a real pleasure to read your posting. I had eaten many other tamblis before. Does this taste a bit similiar to coconut chutney or something? Tried your recipe of onion tambli, turned out absolutly delicious. In this banana tambli wanted to know whether I can roast the banana flower directly on the gas burner like we do for Baingan.Setting up a charcoal fire is difficult for me and I don’t have a fireplace ? Shilpa: Yes Ketaki, you can do it on stove. I made this tambli today,but it was a big flop.Here is what I did.I removed the flowers but u have said “to remove all the flowers till it becomes free frm all the flowers” but it never does ,because the flowers and red leaves are alternately placed.Anyway I stopped at one point and baked the flower.I ground all the other ingredients in the mixee.By the time I added the baked flower to the mixee the white portion had turned black .I continued and finished the recipe.The RESULT: Bitter and sticky with practically no taste.I don’t know what went wrong.Pls help. Shilpa: I am not sure what went wrong. But I think if it is kept for long outside, it turns black – like peeled banana or apple (just guessing). May be next time, you can try keeping it in water. I also think, it may be half done when you took it out. We have a big banana tree in the yard and tonight I went out and cut the flower – cutting it helps make the bananas better. 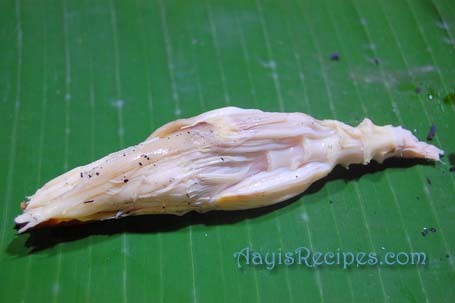 I knew folks in S. India ate banana flowers, so I am excited to give this recipe a try tomorrow. Thanks for sharing and I’ll try and come back with my results.